I have to start by saying the Doberman is my favourite breed of dog. I have owned Dobermans for over forty years and to me they are a great dog to own. The only thing better than owning a Doberman is owning 2 Dobermans. Can you tell that I may be a wee bit prejudice? So where did this great dog originate from? Around 1890 a tax collector from Germany was looking for a dog that would protect him when he would go around and collect the taxes. This tax collector was Karl Friedrich Louis Dobermann and his other job was that he ran the town’s dog pound. With access to so many different breeds of dogs he set out to breed a dog that had speed, endurance, strength, intelligence and ferocity. He also wanted the dog to be loyal to his master. Karl died in 1894 and Otto Goeller along with Philip Greunig continued to develop the breed into what we have today. Although not one hundred percent sure as to what breeds were used to develop the Doberman, the following breeds are believed to have been used. They are the Beauceron. German Pinscher, Rottweiler, Weimaraner, Greyhound, Manchester Terrier and the old German Shepherd. 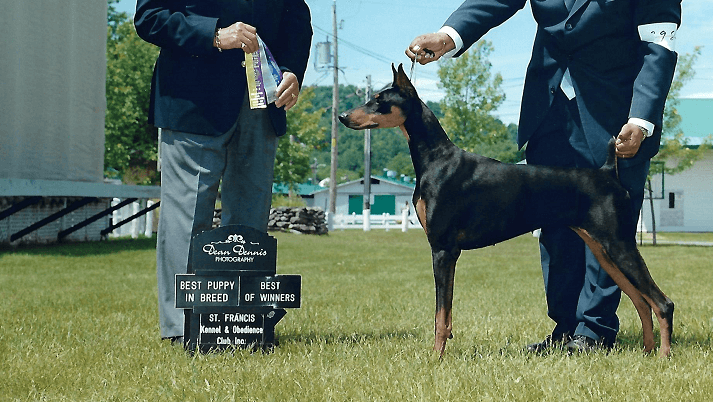 Although the breed standard was written and approved by the German Kennel Club in 1890, the first registered doberman, Graf Belling v. Gronland wasn’t registered until 1898. The first Doberman to register with the American Kennel Club was in 1908. They are part of the working group. The standard for the doberman varies slightly from kennel club to kennel club. With that in mind following are the standards for the American Kennel Club: The Doberman is a dog of medium size with a body that is square. By square they mean the length of the dog should equal it height to the withers. Then the length of its head, neck and legs should be in proportion to its body. So if you have a male doberman who measures 26 inches high this is how long he should be also. Males when measured at the withers should stand between 26 to 28 inches. The ideal height being 27 ½. Females are a bit smaller standing between 24 to 26 inches with the ideal height being 25 ½. As far as weight there is no set standard other than their weight needs to be in proportion with their size. Generally a male weighs between 88 to 99 pounds, while a female weighs between 71 to 77 pounds. Dobermans have short smooth hair coats. Their allowed colours are black, red, blue and fawn. The markings are rust or tan and appear above the eyes and on the muzzle, throat, legs, feet and just below the tail. Although not a requirement to fit the standard many Dobermans have their tails docked, their ears cropped and their dew claws removed. Some countries however have started to make it illegal to crop the ears. For many years the Doberman got a bad rap as being a vicious dog. At one time they were bred for their aggressive tendencies as their main job was as a guard and protector dog. Over the years this has been toned down in the breeding. Now if a Doberman is bred properly and raised and socialized properly nothing could be further from the truth. Nothing gets by a Doberman. They are very alert and watchful. They do need a strong leader since they can be very determined. They are very easy to train so they can be very obedient. They are also fearless and will protect the family. I have owned both male and female Dobermans and in my experience the males can be quite the clowns while the females are comical in a different way. I found with our last female dobe especially she acted like a little princess. The two of them together were quite a team. As far as a family pet the Doberman gets high marks here also. With proper training and socialization the Doberman can be excellent with children. They are also good with other pets in the house especially if they are introduce to the other pet when they are puppies. 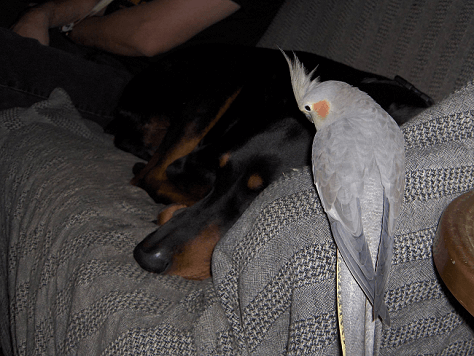 I have also had cockatiels for many years and my two dobies got along great with the birds. It wasn’t unusual to see a dobie walking around with a bird on its head. Dobermans are not the type of dog you put on a chain and stick outside. For that matter no dog should be chained and stuck outside. Dobermans need to be with their people. In the winter they do like to curl up in front of the fire or in their favourite chair. They are also not the type of dog that will spend all day on the couch. They are a high energy dog that need a lot of exercise and they need things to do. These dogs do well in agility. Another sport that they do well in is Schutzhund. Because of their fearlessness the United States Marine Corps adopted the Doberman as its official War Dog during the Second World War. The first K-9 casualty during that war was a Doberman named Cappy. He alerted the marines to the Japanese soldiers on July 23. Although he saved the lives of 250 Marines that day he was mortally wounded by a Japanese grenade. At the War Dog Cemetery Cappy is the bronze statue on top of the WWII War Dog Memorial. He and 24 other Dobermans died in Guam fighting the Japanese. Dobermans have been trained as seeing eye dogs, rescue dogs, police dogs and assistance dogs. On top of all that they do, as I said earlier make a great family pet. They do need a strong alpha leader so they are not for everyone. The Doberman has a lifespan of 10 to 12 years and as with any purebred dog they are prone to certain health issues. The most serious health problems that Dobermans face are Wobbler’s syndrome, cardiomyopathy and von Willebrand’s disease(vWD). They can also be affected with hip dysplasia, cancer, hypothyroidism. Wobbler’s affects large breed dogs like the Great Dane and the Doberman. The vertebrae in the neck narrow or malform putting pressure on the neck area of the spine. You will notice a difference in the way your dog walks. They almost appear like they are drunk as their back end wobbles back and forth. For a proper diagnosis your vet needs to perform a mylogram which is not only an expensive procedure but it is also quite dangerous. Wobblers can be treated using corticosteroids, surgery or a neck brace. There are pros and cons to all these options so you should investigate each option carefully before making any decision. Von Willebrand’s disease is a blood clotting disorder in dogs that is similar to hemophilia in humans. Without enough of this protein which helps the blood to clot a minor cut can be quite serious if your dog is affected. A simple DNA test will let you know if your Doberman is carrying the disorder. Cardiomyopathy is a disease of the heart that affects both male and females alike. Symptoms of cardiomyopathy range from weakness, collapse, difficulty breathing and sudden death. X-rays, EKG’s and Ultrasound are the tools used to diagnose cardiomyopathy. Using these tools vets are able to diagnose the disease before your Doberman shows any symptoms. Medication can be prescribed to help keep the symptoms in check. The Ontario Veterinary College is located in Guelph. They run a study on cardiomyopathy. 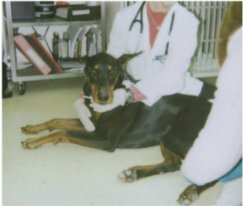 We had our Dobermans in this study and every year they would undergo an ECG and an ultrasound. Since this was a study the cost was minimal. Cancer is another disease that more and more breeds of dogs seem to be getting. 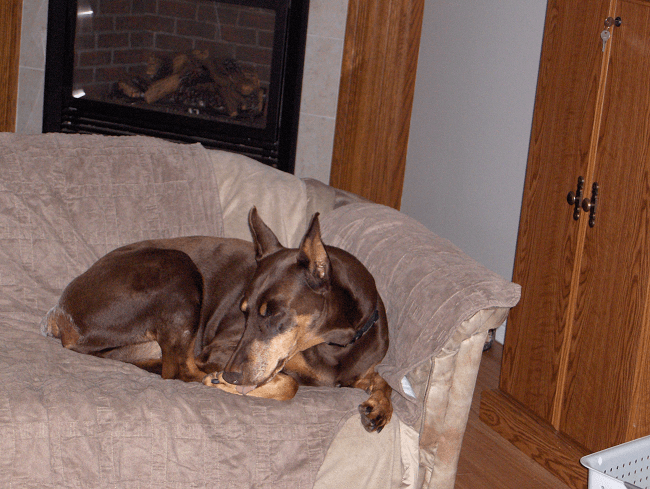 Our male dobe was diagnosed with lymphoma when he was just over three years of age. I found the tiniest lump on his neck and a biopsy gave us the bad news. We took him to the Veterinary College located in Guelph to discuss his options. They recommended chemo and told us it would probably give him a couple of years. After undergoing 26 weeks of chemo he was cancer free but they warned us it would probably come back. When he was nine they found cancer in one of his front toes so the toe was amputated. He lasted almost 3 more years when his heart quit and he dropped dead at the vet’s office while waiting to see the vet. He was almost 12 years old so for a dobe he had a pretty good life, beating the odds a couple of times. In conclusion I would say the dobe is a very well-rounded dog. As with any breed training is very important. “The single greatest cause of death in dogs under one year of age is not Parvo, it’s not Distemper, it is lack of obedience training and 93% of training and behaviour problems can be solved using a series of simple dog training techniques.” Don’t let your dobie be one of these statistics! Check out Doggy Dan Now! 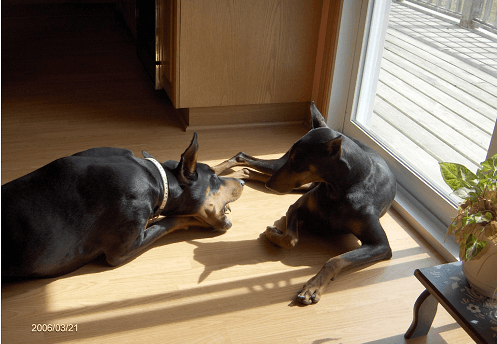 Do you think the Doberman may be the breed for you? There are many rescues that are breed specific. So if you are looking for a purebred Doberman as strictly a pet a rescue may be the way to go. Let me know if you have a favourite breed and feel free to send along a picture. Give your dog a hug tonight! This was one very enjoyable post. I run a dog training site myself and I think your story of the Doberman was great. I do not have much personal experience of Dobermans but from what I have heard they seem to be very attached to their family but often distant to other people. What is your experience of that? How does your dog get along with your friends and visitors? Dobermans are truly beautiful dogs and they are intelligent to, but like you say, they are not for everyone, they need a firm leader. Hi Jojo thanks for your comments. Dobermans are very attached to their family. They are good with other people also. They will bark when someone comes over but when seeing there is no threat they settle down pretty quick. Our two dobes were excellent with other people but they were exposed to a lot of things. Both dogs were shown and attained their Canadian championship. When showing a dog it can be quite hectic. There are people and dogs everywhere. The judge does not just look at the dogs he has his hands on the dog. He will run his hands down the dog he will open their mouth to check the teeth etc. The dog cannot show aggression or shy away when this is being done. Both of our dobes went through this so they were not the least bit jumpy when approached by a stranger. So exposing your dog to a lot of different situations when they are young will definitely help later when encountering different things. Thanks for your comment Nicole. You are so right when you say it is not how they are born but how they are raised. These dogs can be so loving and loyal why anyone would want to turn them into a vicious dog is beyond me. There are certain people who just should not own a dog! 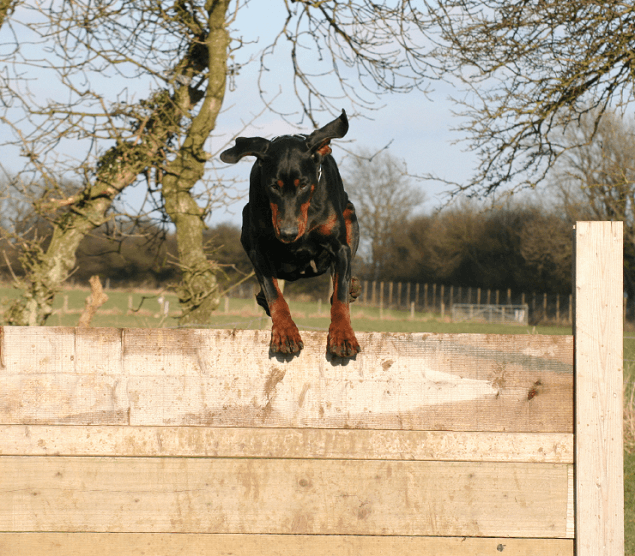 It is good to see a Dobie owner putting in the time to train and promote this wonderful breed. I am so sorry for your loss, losing Wylie. I’m glad he had a long good life considering almost losing his life twice. This article is very informative about this specific breed. The history of the Doberman was interesting although I found the tail docking, ear’s cropping, and claws removed a bit horrifying. I agree that Dobermans just like any other breed can be trained properly and Dobermans can be a very good family dog. I’ve heard and read that this breed has attacked family members but I know if they properly trained their dogs this would not happen. I love the way Doggy Dan works with dogs. He does excellent work in training dogs, any breed. Great post! Thanks for sharing. Hi Rosa it is unfortunate that we hear about certain breeds attacking people. Chihuahuas also attack people but because they are small they do not inflict much damage like a big dog like the doberman so therefore they are not newsworthy. No breed is immune to bad behaviour. Sometimes dogs are not trained properly or they are not socialized properly. Some dogs are not raised around children and when they eventually encounter a child they are not sure about the child. Parents should not allow their children just to run up to a strange dog. They should always ask the owner if it is OK to approach the dog. This is a little off topic but it totally amazes me how many people, adults included, want to pet a service dog. This dog is working. If you are busy doing your job would you want to be distracted? Thoroughly enjoyed your article on the Doberman Breed. The love that you have for the dog and the breed rang clear throughout. I am glad for your and your companions for that love. The details regarding health, both present and future exercise needs were interesting. These conditions as you well know can effect the choice of breed. Per your request my 5th Golden Retriever is almost three years old. She is well loved, but as you know returns more than I can give her. Very active running daily and lots of time in the Lake or Ocean 5-6 days a week. Thanks for you caring for your choice for breed and dedication. We all need others to do well with what they have. All the Best! Hi Robert thanks for your comments. It is amazing how much love our dogs do return to us. I have had some difficult times in my life which we all have had but having a dog just makes it so much easier to cope with. They make you get up and going even if you don’t feel like it and because of that you do feel better. I know if I didn’t have a dog I would not be walking everyday.